Prep the chicken: Whisk together the flour, salt, and pepper in a large bowl. Slice the chicken breasts, cutting on the bias, into pieces about 1 inch thick. Cover the pieces with plastic wrap and, using a meat pounder or rolling pin, pound them to a thickness of ½ inch. Dredge the chicken in the flour mixture and shake off any excess flour. Begin the pasta: Bring a stockpot of salted water to a boil. Cook the pasta while you sauté the chicken and start the pan sauce. When the pasta is al dente, drain it and return it to the stockpot; drizzle with a little olive oil to prevent it from sticking together. Cook the chicken: In a large, heavy-bottomed skillet over medium-high heat, heat about 2 tablespoons each of olive oil and butter. When the fats begin to foam, add the floured chicken pieces. Sauté the chicken for just a couple of minutes, until seared and browned; flip and cook the other side. When done, remove to a heatproof plate and place in the preheated oven to keep warm. Make the sauce and finish the pasta: Add more olive oil and butter to the skillet if necessary, then sauté the onion and garlic until softened. Add the wine, if using, and the chicken stock, and bring to a boil, scraping the bottom of the pan with a wooden spoon to pick up any browned bits from the chicken. 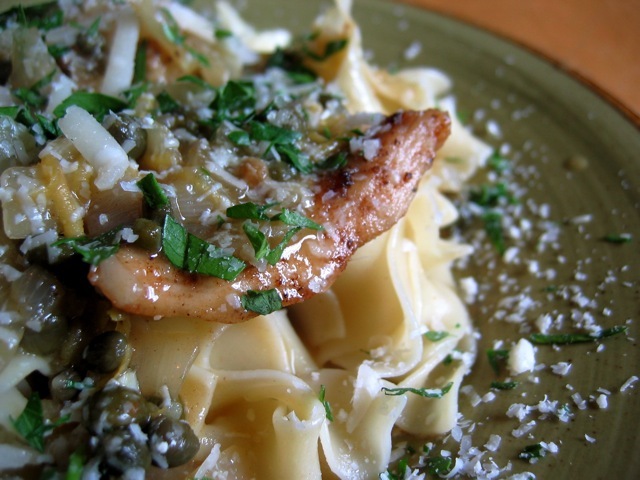 Add the capers, lemon zest, and lemon juice, and pour the sauce over the al dente pasta in the stockpot. Assemble the dish: Slice the chicken pieces crosswise, if you wish, and arrange them over individual portions of sauced pasta. Garnish with the parsley and cheese, passing more of both at the table, if desired. Read more about scallopine-style dishes in Kelly Myers' "By the pound."